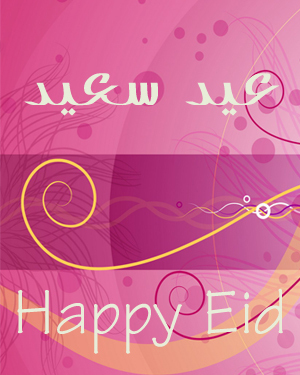 Sweets, Fruits, Turkish coffee, Chocolate and other treats are served to guests at Eid. 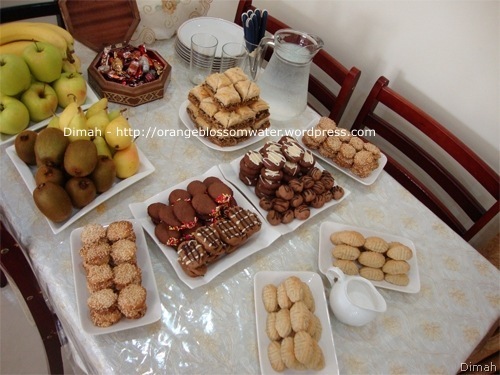 In Syria, traditional sweets are prepared such as Ma’moul, Ghraibeh, Karabeej, Barazeq, Baklava, and non traditional sweets like spritz cookies and others. Qamar Ad-Din is dried apricot paste, the origin of Qamar Ad-Din is Syria. Sharab Qamar Ad-Din is a very poplular drink for breaking the fast in the month of Ramadan. Qamar Ad-Din is also used with various recipes such as Mhlabiyeh (Qamar Ad-din Pudding) and Nqou’eiyeh (Qamar Ad-Din cooked with rice). 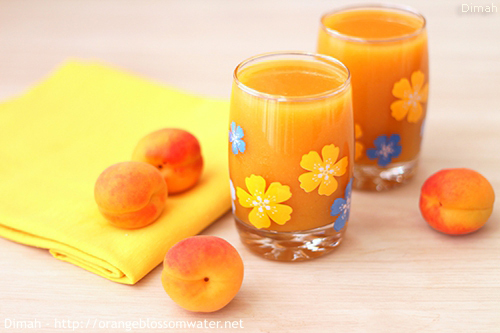 Drinks like Juice, Milk, Laban A’yran which is a drink made of Yogurt and water . 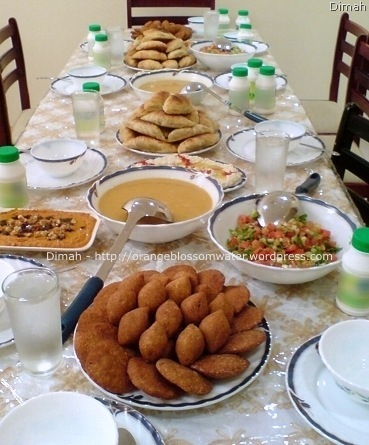 Appetizers like Kibbeh Maqliyeh, Hummus, Mutabal, Muhammara, Batersh, Pizza, Cheese Sambousek. Main Course like Yabraq (stuffed grape leaves), Sheikh Al-Mehshi (I’ll post about it soon), Ush Al-Bulbul, Sambousek Mwarraq, Mloukhiyeh(Jaw’s Mellow, I’ll post about it soon). 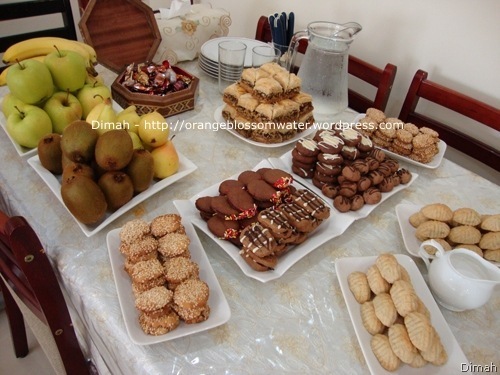 Desserts like Qatayef, Knafeh, Loukumads. There are two meals in Ramadan, Suhoor and Iftar. “Suhoor, is an Islamic term referring to the meal consumed early in the morning by Muslims before fasting, in daylight hours during the Islamic month of Ramadan. The meal is eaten before the fajr or dawn. Suhoor as the morning meal is matched by Iftar as the evening meal, during Ramadan, replacing the traditional three meals a day (breakfast, lunch and dinner), although in some places dinner is also consumed after Iftar later during the night. Being the only meal eaten by Muslims from dawn to sunset during the month of Ramadan. Source: wikipedia”. Suhoor is like breakfast, we eat cheeses, Labneh, Makdous, Halawa, Jams, and some times cakes (I’ll post about “Typical Syrian Breakfast” in the future and you will know more about makdous, halawa and other things). I made this cake for suhoor. In my family we prefer “eggless cake” in suhoor, because suhoor is before fajir around 3:45 am, and nobody likes to eat anything with eggs at this time. I made two cakes, the first one like the original recipe which is eggless cake with saffron and walnuts, but I made tiny changes and added cardamom to the cake and replaced the walnuts with hazelnuts. 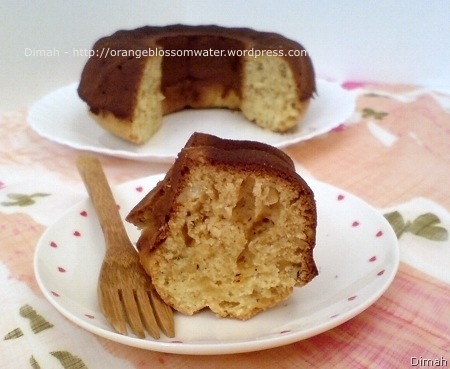 The second cake, I added cocoa powder instead of saffron and cardamom, also I used chcoclate chips and hazelnuts.